SaaS loves data. Every SaaS tool has a richness of data available, but the difference lies in how each SaaS uses it. In this series, we’re looking at smart SaaS companies that turn their data into an asset! This month, we’re featuring Practice Ignition. Let’s see how they help their customers make better decisions. The data involved with sales proposals? Clients: how is the customer base evolving? Revenue: how much is each customer worth? Pipeline: accepted vs. refused proposals? Payments: how many invoices are still open? Any payment issues? Projections: projected revenue based on sent proposals? With built-in dashboards, Practice Ignition makes all of that information insightful to their customers. The platform is mostly used by managers & business owners in professional service businesses. How did that influence the dashboards? In terms of cashflow, the dashboard includes some interesting stats. For example, you can take direct action on rejected credit cards, or those close to expiring. In terms of revenue, you’ll see a projection for the current year, and how much has been invoiced already. This lets you assess at a glance how you’re achieving your goals. What’s more, every manager has a visual view on their pipeline. You can monitor how you’re converting prospects into sales, how long it’s taking your leads to accept a proposal, and how much potential revenue is still open. If your app is helping with complex acquisition models, or complex sales processes, you will benefit from more advanced charts. It will help you transform complex information into something easy to read. In this case, however, the data is already quite straight-forward. In addition, the audience of business owners typically wants hard numbers, so why give them fluffy charts they don’t need? They won’t gain as much value, because it’s not what they are looking for. From a user point-of-view, having access to this kind of analytics is a no-brainer. A user takes it for granted to have such insights readily available in your app. From a business perspective, it’s not that straight-forward, unfortunately. Developing analytics yourself costs a lot of time and resources. For many companies, it’s not even an option. Luckily, there are platforms that allow you to build & integrate dashboards. This is a much faster, cheaper, and sustainable long-term solution. However, as a developer or product manager, you might worry about defending the analytics investment towards your upper management. Now, here’s where you can really learn from Practice Ignition. Don’t see analytics as a cost center. It can also be a revenue driver. If the dashboards are a real added value to your users, they are willing to pay for it. And this is exactly how Practice Ignition approached it. 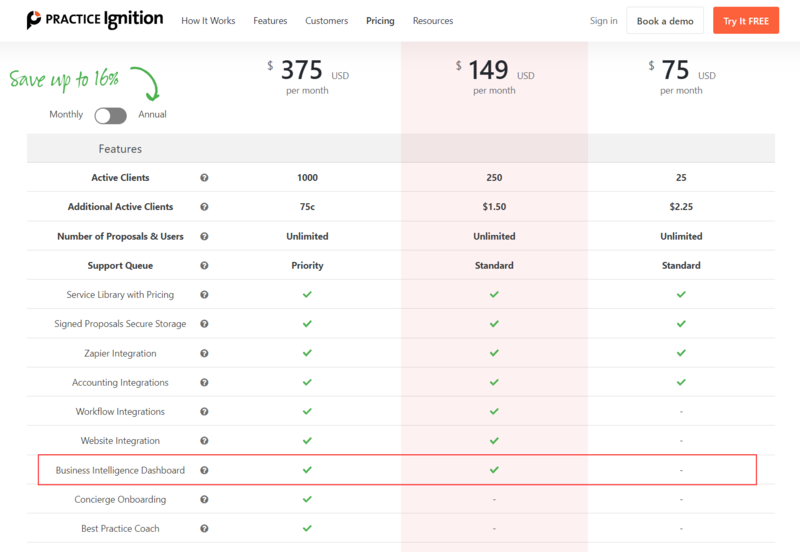 They offer the dashboards in premium pricing tiers only. In that way, you can meet real client needs, while easily upselling existing customers. In no time, you’ll turn the analytics investment into a source of income. Who is my customer? What insights is (s)he looking for? Before starting off, understand what the customer needs. Learn what they are struggling with, and which insights they desperately need. Talk to your best customers, and learn from their needs. Why add complex flowcharts, if your customer only wants simple MoM comparisons? Again, start from your audience. Use visualizations that match the user ánd the data. Don’t treat analytics as an investment. 78% of SaaS charges their customers for dashboards. Next to this direct relation to revenue, don’t underestimate the impact of indirect factors. Analytics increases satisfaction, time on platform, and reduces churn.